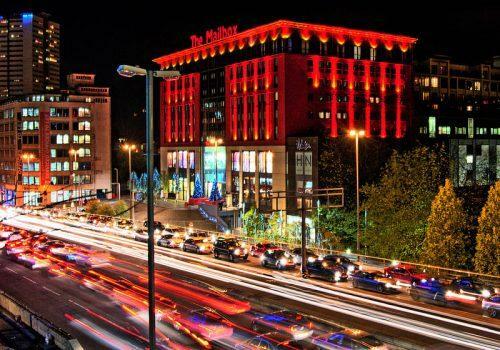 Premier Technical Services Group PLC (PTSG) has landed a significant Access and Safety contract at Mailbox Birmingham, the city’s premier shopping and lifestyle destination. The Group’s talented Access and Safety engineers will attend the site to carry out rigorous tests to its fall arrest systems and cradles, ensuring that any operative carrying out work at height at the centre in future is safe and secure. The Mailbox is one of Europe’s largest mixed-use buildings, featuring retail, leisure, office and residential space in one complex. The building was originally home to the Royal Mail’s sorting office for Birmingham, before its conversion into a luxury shopping centre in 1998. The site is now home to a number of high-profile designer stores, as well as serving as the base for BBC Birmingham. PTSG is well known for its excellence in working at height. The company was recently featured in PFM magazine for its commitment to raising health and safety standards across the facilities management industry by always going above and beyond the standards required for compliance. This approach has resulted in a number of awards, including two RoSPA Gold Medals and seven consecutive International Safety Awards from the British Safety Council.